It all started when Fleecircus saw this YouTube video of Clay Enos (screenshots shown below), a celebrity photographer from New York who set up a street studio composed simply of a white wall, camped in a street corner, and asked random passers by if he could take a portrait of them. 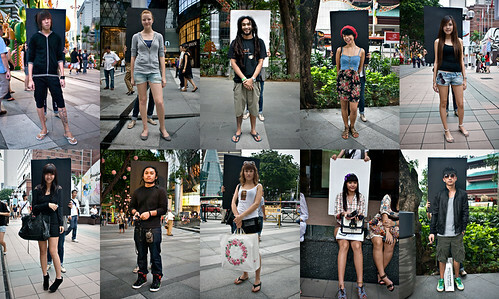 We loved the results, and even more so, we loved the idea of taking portraits of different people in the streets. We immediately got inspired and knew we had to do the same here in Singapore. With the YouTube video in mind, we started to plan out the details of this exciting new project. Initially, the idea was to do exactly what Clay Enos did: camp in one spot, set up a white wall as background, and ask passers by if we could take their picture. However, as we discussed the project further, we figured we wanted to cover more grounds, so instead of camping in one spot waiting for people to pass by, we walk around to actively look for potential subjects; and instead of a white wall as background, we bring a mounting board along. This also allows us to have both white or black background to ensure good contrast depending on the subject’s hair color, skin tone, or getup. We then setup a page in Flickr and Facebook where we could upload all the portraits we took. For the finishing touches, Fleecircus designed a kickass logo for the project, and had business cards printed – something we could hand out to the subjects so they could later see their photos online. We were all set. The first day of shoot was quite enlightening. Prior to this, we had no idea how the people would react to us. But after shooting a few subjects, we realized this wasn’t going to be so hard at all. A lot of people we approached were actually open to the idea of being photographed – some were hesitant that needed a little more convincing, some were just confused but said yes anyway, some were pretty happy for being asked, and heck, some even just shouted ‘yes!’ before we could finish our sentence. However, the best reaction for us came after a few weeks of shooting – some would say ‘oh, I heard about you guys!’ Hearing this just made us smile from ear to ear. Cool Glasses: You can’t go wrong with a good pair of glasses that fits you. Some were pretty extravagant, and others were so simple yet perfectly complemented their look and attitude. Classy Hat: This fashion accessory no doubt indicates panache to it’s owner. With so many shapes and sizes… and ways to wear them, a good hat on a good-looking head is a magnet for portraits. Facial Hair: These guys are next in line with the tattooed ones in terms of coolness. Mean looking manly men, but were surprisingly very pleasant when we approached them. Prior to this project, Fleecircus and myself were primarily shooting candid photographs on the streets. We’d be a fly on a wall as we observe the people around us. This project, however, gave us a chance to connect with our subjects. Getting to actually meet these people of different kinds of personalities with their different ways of reacting to us was an eye opener. This project also gave us a chance to practice and improve our portraiture skills. The more we shot, the more we realized common mistakes, the more we became more conscious of significant elements like the quality of available light… and the more we tweaked our style to make better portraits. Someday, we’d like to be our version of Leibovitz or Avedon. 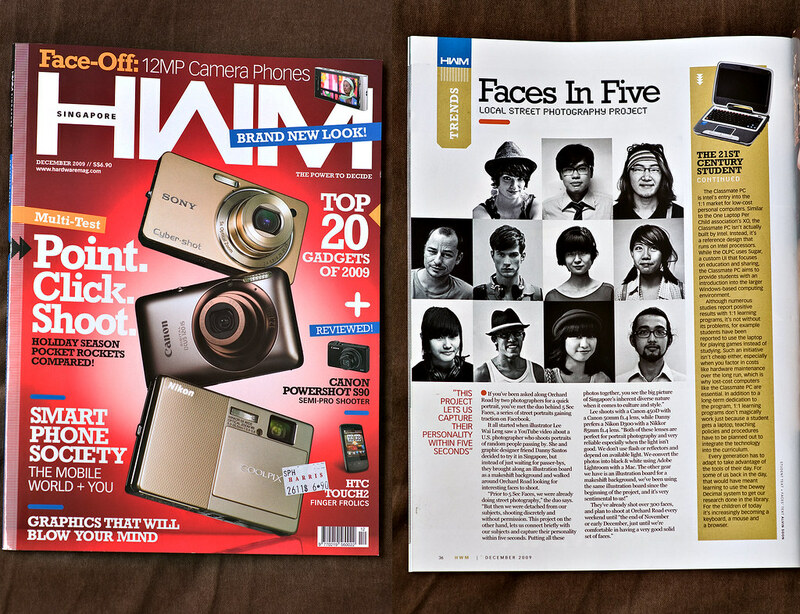 So after shooting for 10 weekends, we’ve finally gathered a good solid set of faces. We decided to stop shooting and start planning the next steps. If things go our way, we’re hoping to set up a local exhibit to show the portraits together in large prints. A coffee table book will go along with the exhibit to show some of the most interesting faces we’ve photographed. And lastly, we’d like to set up a social network site where interested photographers from around the world can submit their own ‘5 Sec Faces’ portraits from their area – making the project global. Hopefully, there will be interest from other photography enthusiasts and professionals. This was more than just a collection of faces. Each single portrait is 5 seconds of their life while they were nonchalantly doing their own thing in the middle of the street. Some smiled, others didn’t… some gave a tough look, others a sweet glance… some were shy, others were rowdy… Looking at the different personal styles of each subject, how they reacted given the same situation, you can clearly see how each one is so unique, yet perfectly balances and complements each other, showcasing a collective portrait of Singapore’s beauty and variety… as well as it’s cool attitude towards something as spontaneously unusual and fun as having their pictures taken by complete strangers in the street. 5 Sec Faces is a photography collaboration between Fleecircus and myself. 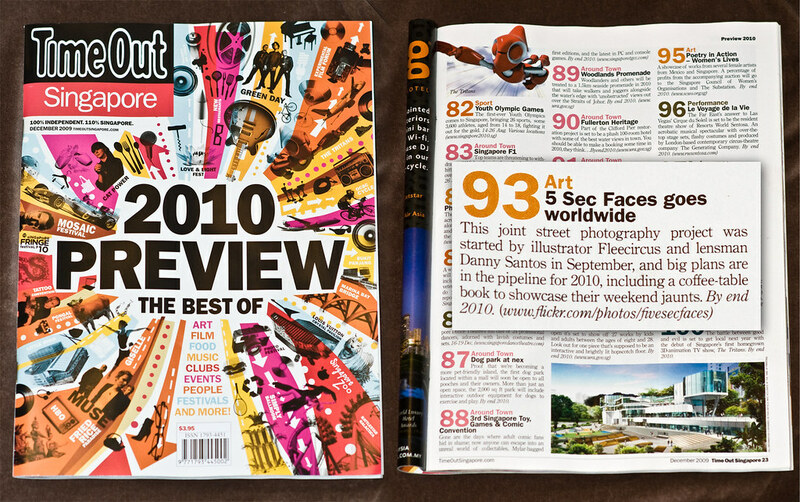 All photos shown in this article were taken by both of us. To view all of the portraits we’ve taken, please visit our Facebook, or Flickr page. I would like to thank you for the efforts you have put in writing this website. I am hoping the same high-grade website post from you in the upcoming also. Actually your creative writing abilities has encouraged me to get my own web site now. Really the blogging is spreading its wings rapidly. Your write up is a great example of it.